The main sources of funding for the project will come from Community Shares, Grants, Sponsorship, and Fundraising events. It is a requirement under the Rules of the Society to hold our first general meeting of our Members before 8th June 2018 which is 6 months following the end to the Society’s financial year. For us to be able to hold an annual meeting we need Members and people who have subscribed to a minimum number of five community shares at £10 each. If we are to be successful in raising funds by applying for grants, we need to demonstrate that our community is willing to invest in the project through the purchase of Community Shares. Before applying for any major grants the Society must own The George and to that end we need to have sufficient funds to complete the purchase. Unless we were to receive a substantial gift or donation, those funds can only come from the proceed of a Community Share offer. Before applying for any major grants the Society must own The George and to that end we need to have sufficient funds to complete the purchase. Unless we were to receive a substantial gift or donation, those funds can only come from the proceeds of a Community Share offer. Grants will make up the largest proportion (~80%) of the funds required to carry out the re-building programme. The risk is, simply, that this level of funding will not be achieved; however, given the circumstance of the project, the evidence is that the George is eligible for such funding on a number of grounds: principally, those of heritage, social need and well-being and community engagement. There is also proof that there are more than enough potential funds available to meet the likely needs and that they have been previously been made available to similar projects. Given the size of the funding requirement and the dependence on a few major funding bodies it will be necessary to pay particular attention to the project’s eligibility for the grants applied for. The Society acknowledges that even good projects may not achieve funding at the first attempt, but the consensus amongst grant providers and fund-raisers consulted is that rejection on a first application often an opportunity to present a better second proposal. In order to adequately prepare itself for the grant application process the Society has set up a sub-group of its Management Committee whose responsibility it will be to make the grant applications on its behalf. That sub-group has prepared itself by taking advantage of training delivered by Community Action Suffolk and by the East Suffolk Partnership, which has included sessions on writing funding applications, fundraising plans and strategies, governance and measuring success (monitoring and engagement) to help ensure that applications for funding will be made that have the greatest possible chances of success. If considered necessary, professional fund-raising consultants will be engaged to further enhance our capacity to achieve the required level of funding. There is a cost associated with using consultants but this is usually success related. The Society has carried out research on potential sources of grant funding in order to determine the availability of sufficient funds to make the proposed project viable. The research was carried out using the on-line funding databases, such as the Funding 4 Suffolk resource provided by Community Action Suffolk and through consultation with other grant-funded organisations, advisors such as CAS, the Plunkett Foundation, the Heritage Trust Network and the Architectural Heritage Fund and grant providers themselves. The outcome of that research has been a comprehensive analysis of the grant funding sources which are most applicable to the Society’s funding needs. Tier 1 (Key) – those grants which the Society must obtain. Tier 3 (Strategic) –other grants relating to a particular heritage or community objective. There can be no guarantee that all of the Society's grant applications will be successful, but it has been established that potential funding exceeds the total amount of grant income the Society requires in order to meet its objectives by approximately 85%. The success in applying for these grants has demonstrated that the Society is able to manage the grant application process and that the Project addresses needs and issues which grant providers consider worthy of funding. 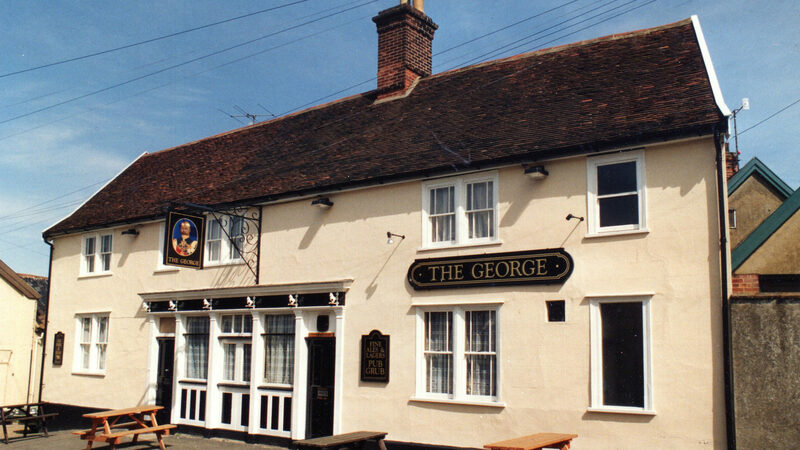 During the rebuilding of The George we will be actively seeking sponsorship from commercial organisations or individuals who recognise the benefits, considering the scale of the project and the expected publicity, in an association with The George and Wickham Market. Income is welcome from all sources, including generous individual donations already received, but particularly, and most enjoyably for the whole community, from the Society’s Community Fundraising Activities. To date a series of very successful fundraising events have been held - see our blog and events page for more information. Other sources include gifts of which several have been received to date.